The RASTRA wall building system is the ultimate answer for economical and environment- effective construction. A stay-in-place insulated concrete form (ICS’s) system made of a lightweight composition with a higher than 80% content of recycled material. Rastra is made from a lightweight honeycomb like mixture of small foam beads, like recycled packing material, food containers and modified concrete. It has a high insulation value and is resistant against fire, frost and other climate influence. It takes stucco or other types of wall covering very well. Installation of the Rastra elements is very simple and does not require special skills or tools, making it well suited for the owner/builder. Rastra walls go up much faster then conventional methods of building and unlike framed walls, are ready for finishing once the cells are filled. The blocks are basically stacked one on top of another and glued together with a foam adhesive. Once the walls are constructed, the cells are filled with concrete, reinforced with rebar, and very little bracing is needed. You can cut and shape the blocks with just about anything; an electric chainsaw works great or you can cut they by hand. R-value of about 35 and weights 148 lbs. Two people can easily lift the blocks into place, or a lift can be used. We have built walls up to 12 ft. high working off scaffolding. Any type of roof structure can be used with the Rastra system, and walls up to 6 stories high are possible. 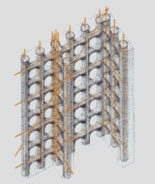 The interior grid of horizontal and vertical reinforced concrete cells, as shown in the picture to the left, makes for walls with strengths 700% higher than traditionally used framed shear walls. Because Rastra is frost-proof and insensitive to temperature or moisture, it is well suited for below grade construction. Unlike conventional-frame construction, you can start a Rastra wall right on top of the footer and continue up to the roof, a great time and money saver. You can easily create curved walls, cut out arched doors and windows and even use rastra for the roof. The plumbing and electrical lines can be placed in the cells prier to grouting or can be cut into the elements and foamed over. For more detailed information on building with Rastra you can request a copy of the Rastra Installation Guide from my contact page or go to www.rastra.com. Insulation is rated in terms of thermal resistance, called R-values. The higher the R-value, the greater the insulating effectiveness. You also need to factor in the performance of the whole wall, such as thermal mass, air tightness, and moisture tolerance. It should be noted that these values do not include the other benefits such as tightness or stucco and plaster wall finishes. Most building systems base R-values on a section of wall do not include design details that interfere with the insulating envelope, such as studs, headers, and corner details. Therefore the standard 2x6 framed wall with R-19 infill insulation between the studs and 1 inch ridge exterior insulation, rated at R-21 is more then likely over rated. Washington State energy code requires exterior walls to be a minimum of R-21 for this climate zone. Comparing a Rastra wall to a standard wood framed wall is somewhat problematic, because it would difficult and very costly to build a wood wall with all the properties of a Rastra wall, such as 4-hour fire rating, mold and rot resistance, and thermal mass effect. So it is important to remember that you are not comparing apples to apples when you look at these two wall systems. Also keep in mind that the walls of most residential buildings only account for about 15% of the total cost of the structure. To get a true comparisons of the shell price of the two wall systems you need to compare the framed wall completed from sheet rock on the inside to being ready for stucco on the outside. Depending on your location and the nature of your building project, a Rastra wall will cost about 10 to 15% more then a wood framed wall. The cost of the 12 inch thick Rastra material delivered to eastern Washington is about $4.50 per sq ft of wall. Call or e-mail for current pricing and estimating for your project.